In our latest look at this chart on the best small guitars we were satisfied with our existing model recommendations. However, we decided to add a bit of a wildcard in the Yamaha GL1 – a fun little guitalele! While we can all appreciate the complex tone of a Dreadnought or the booming resonance of a Jumbo guitar, sometimes a small guitar is what’s needed. What is a Small/Mini Guitar? Who Would Want a Small Guitar? Perhaps you are hitting the road and need a lightweight companion. Maybe you find a smaller guitar easier to hold. Whatever the reason – we hear you. This is exactly why we have put together this article, which highlights the best small acoustic guitars on the market, spanning several different styles and price ranges. Note that these are small guitars – we aren’t highlighting dedicated travel guitars or parlor guitars (although there may be some crossover). If you want more detailed looks at both those styles, check out our dedicated article on parlor guitars or our article on travel guitars. Without further ado, let’s jump straight into the chart! Great tone and awesome projection for such a small guitar. An affordable and powerful icon in the mini guitars world. This Dragonfly is more than just good looks! Takamine’s mini guitar with jumbo potential. A mini version of the popular Yamaha FG Series. Small acoustic guitar with impressive rock attitude. Half guitar, half ukulele… full-on fun! Topping this list is a Taylor, which should come as no surprise – this popular brand knows how to make a stellar acoustic guitar! The Baby Taylor BT2 is their mahogany offering and it is one that boasts a surprisingly great tone for such a petite acoustic. As we mention in the full BT2 review, the materials on this baby are very commendable, with a solid mahogany top and laminated sapele back and sides. As with all Taylors, it is comfortable and fun to play, while the projection is one of the best on this list – helped due to the back being slightly arched. At a relatively affordable price, this is a great choice. Not to be outdone by Taylor, the iconic American brand Martin also offers a fantastic small guitar that pushes for top spot. The LXM or ‘Little Martin’ is an icon in itself, being Martin’s smallest and most affordable model, although it still boasts a pretty powerful projection and decent tone – not to mention a robust build. In contrast to the wood used on the Baby Taylor, the LXM features Martin’s eco-friendly construction throughout, with mahogany HPL across the body, a 23” scale length rust birch laminate neck, and a Micarta fretboard and bridge. Comfort and playability are excellent, even for players with larger hands. 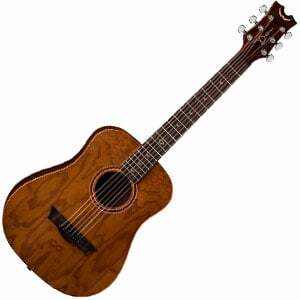 There is more on this excellent small guitar in the complete Martin LXM review. Luna’s eye-catching Dragonfly soundhole design is a familiar one that the brand uses on several of its instruments, including full-size guitars and ukuleles, as well as this superb 3/4-size acoustic. Part of the Luna’s affordable Safari Series, this compact guitar also features a traditional all-laminate mahogany and spruce construction, with a 22” scale length mahogany neck and 18-fret walnut fretboard. It feels light and comfortable to hold and play, and has a bright and enchanting tone – surprisingly big in volume for a petite entry-level guitar. Coming in at under $200, it could be hard to turn down for beginners, small-handed players or children – especially those who value aesthetics. There’s more in the full Luna Dragonfly review. This list needed some electro-acoustic models and for this we didn’t have to look much further than Takamine, who offers the cute GX18CE-NS. This interesting acoustic features Takamine’s familiar NEX body shape with a scale length of 22.5”, making it perfect for smaller players. The body itself features a cutaway and is made with laminated mahogany and capped with a solid spruce top. There’s also a mahogany neck with a laurel fretboard and 21 easily-accessible frets. 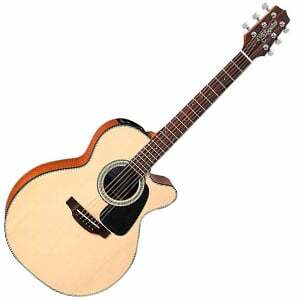 It comes loaded with Takamine’s TP4T preamp system, with 3-band EQ and a built-in tuner. A quality little system. It’s not perfect, but it’s a great purchase for those wanting to amplify their sound on the road. There’s more in the complete GX18CE-NS review. One of the most affordable acoustics on this chart comes from Washburn subsidiary Oscar Schmidt. While the name may not hold as much weight as a Martin, this brand has made guitars since the late 1800s and has plenty of experience in crafting a good one! The 3/4-sized OG1 is certainly one of these, showing off unique style with several finish choices (from pink to flame yellow burst). It’s made in China, but the fit and finish of this guitar are very commendable, with a laminated spruce top and catalpa back and sides. While the tone is not on the same level as the Baby Taylor, for such a small price it’s a smart choice! Be sure to check out the full OG1 review. We move onto something for the budget-conscious with the JR1 from Yamaha. 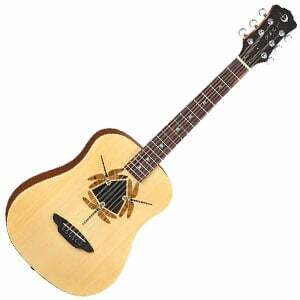 This popular acoustic guitar features a 3/4-size body (21.25” scale length) that is modelled on Yamaha’s famous FG Series. While there’s nothing premium about its design, the JR1 is cute and compact, and feels very well-made for an entry-level instrument. Coming in at such a wallet-friendly price tag, the JR1 is naturally made entirely of laminated materials, with a mahogany neck and a 20-fret rosewood fretboard, offering a full playing experience. As we mention in the full JR1 review, the tone of this little beauty is not bad at all – the dreadnought body shape giving it a sturdy voice. For a small guitar with a little rock attitude, look no further than Dean. Part of the brand’s travel-friendly Flight Series, the 3/4-sized Bubinga model is more than simply something to bash around on the road. Most notably, it shows off a pleasing bubinga grain on the top while the back and side are made of laminated mahogany. Also, sitting on top of the 19-fret mahogany neck is that distinctive Dean winged headstock. 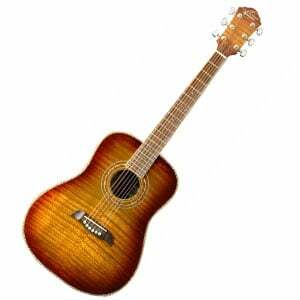 It looks cool and is fun to play, but the tone is equally impressive for a small acoustic. It’s no match for a larger guitar, but the sound is surprisingly full and rich. You can read the full review of the Dean Flight Series Bubinga for more details. 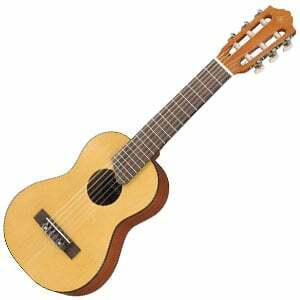 The GL1 is a bit of a wildcard considering it is half classical guitar, half tenor ukulele – aka, a guitalele! With the same tuning as a guitar, albeit five half steps higher in pitch, you can play the GL1 as a ukulele (G-C-E-A) or a standard guitar (A-D-G-C-E-A). In the full review of the Yamaha GL1 we talk about the size in more depth, but it’s relatively comfortable to play when you get used to it. With such a compact size, it makes a great travel guitar, as well as something to keep around the home. It’s an affordable instrument, so the all-laminate construction is on par with what we expected, while Yamaha have ensured it is built to last. Good fun! It sounds like there is an obvious answer to this – but with other similar markets such as travel guitars and parlor guitars, as well as plenty of crossover, the phrase ‘small guitars’ suddenly seems a bit vague. To clarify, we would class a small guitar as a compact guitar that you could travel around with, although that is not its primary use. 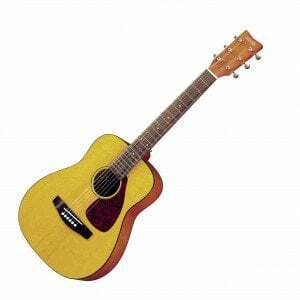 So, a 3/4 or 1/2-sized acoustic which is noticeably smaller than a regular Dreadnought, Concert or even a Parlor guitar. It could be something you leave around the house for playing when inspiration strikes – a small guitar takes up less room in the corner of the bedroom than a Jumbo! Just like guitars, guitar players come in all shapes and sizes. So, a small guitar would probably be handy for a smaller player – perhaps somebody with small hands or a small body, or somebody with an injury that impedes their movement on a regular guitar. Ultimately, a small guitar will be useful for anyone who may find a regular guitar too awkward and cumbersome to hold and play. This is also the reason why small guitars are useful for children. Beginners are another group of players that may find small guitars very useful, as the reduced scale lengths and narrower necks makes fretting chords a little easier. After all, it works for guitarists like Ed Sheeran, who famously uses a Little Martin for pretty much everything he does. We’ve mentioned the travel aspect too, which is still valid. Although there are many dedicated travel guitars, if your main guitar is a small guitar, you can easily take it with you whenever you are off on the road. For those who find regular guitars too big, small guitars are a godsend – now there is no excuse to play badly if you have small hands! There are loads of small guitars on the market – some great, some not so good. However, we hope this article has shown you what a good small guitar can offer and that it has inspired you to find a compact instrument with which to learn or progress.